We know this new Ecoboost Expedition is going to be a towing beast. Post your Ecoboosted Expedition Photos here. 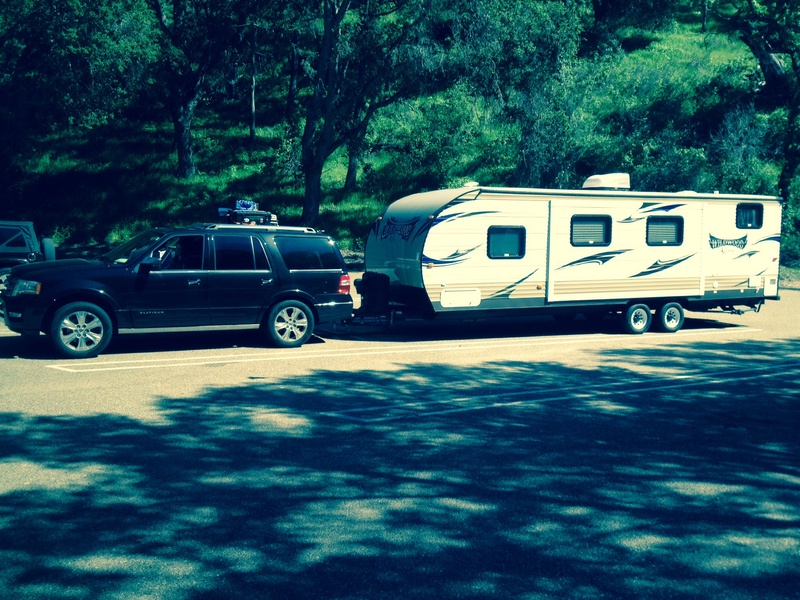 Our family of 6 rented a Salem 31ft trailer that has a 7100 dry weight and drove it on a 1500 mile, 10-day trip. Our 2015 Expedition EL Limited pulled it just fine. The power situation was much better than the 2001 F250 7.3 diesel it replaced. I felt the diesel was constantly struggling to pull this trailer whereas the Expedition seemed to have oodles of extra power and rarely had to downshift. Although we did not do any mountain driving I am sure it would handle that just fine. The builtin trans temp gauge never really budged from around 200 degrees. My F250 had a 178" wheelbase (vs 131 for Expedition EL) and 19.5" heavy duty tires so comparatively the Expedition feels less stable but it never felt unsafe. Of course I had a WD hitch and the Reese anti-sway control device. The family is way happier riding in the Expedition vs the F250 and that makes a big difference on long trips. 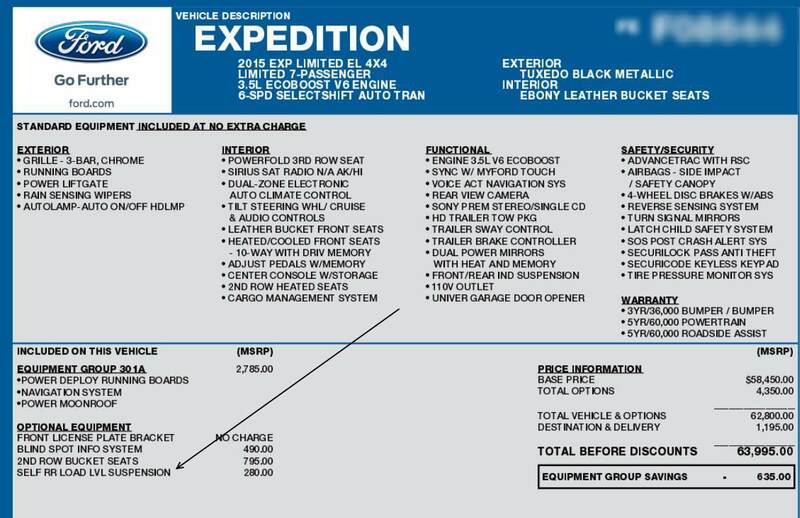 All in all I am very happy with the Expedition as a tow vehicle but as I consider purchasing a trailer I will likely try to keep the length under 30' and GVWR < 8000 lbs so I have plenty of safety margin. 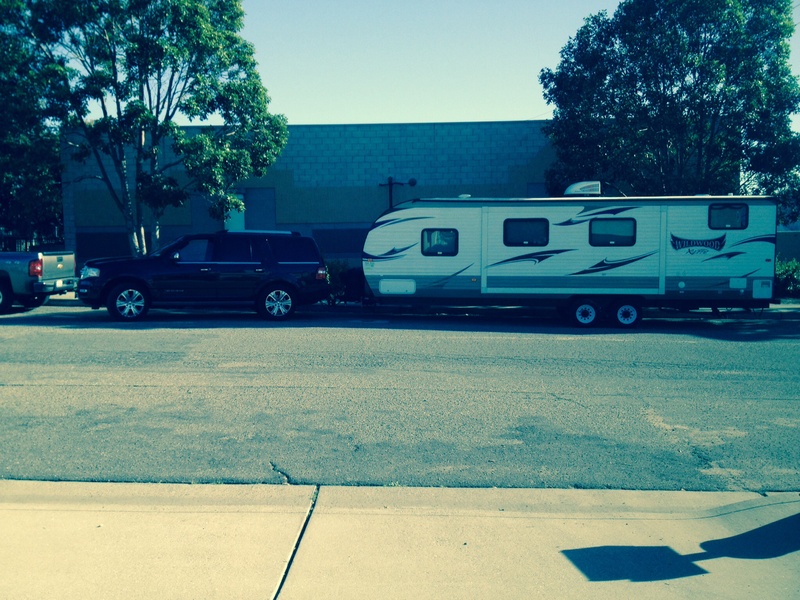 Do you have the rear air suspension, and if so, did it help a lot with the towing? Yes I got the rear load leveling option. While it did still feel a bit squirrelly at the front end I think without the load leveling option it would have been much worse. The load leveling in my case did not cause the Expedition to sit completely level with the trailer I towed but it comes pretty close. My feeling is that without the load-leveling option I would not have been able to safely tow the trailer. According to Wikipedia it is not the previous "adaptive pneumatic air-ride load-leveling suspension" but rather the new-for-2014 mechanical Nivomat system. my only complaint so far with mine.. mine feels somewhat squirrelly as well..
My 2015 Platinum towing our Wildwood bunkhouse. These things tow great. 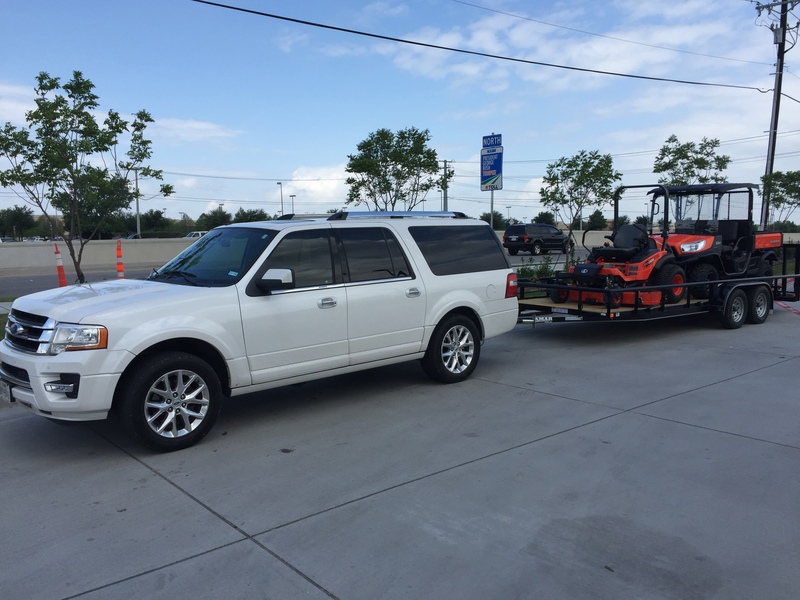 I also have a 2014 Suburban and I much prefer the Expedition while towing the trailer. Huh, I am really liking the expedition. I'm really impressed they can tow that well. Same 3.5 engine as the F150. The vehicle weighs within a few hundred pounds of the F150 screw so it's got the mass to not get pushed around by a decent load out back. Suspension is up to par and it's got a pretty solid tow rating for a vehicle that can handle "mini-van-like" people moving duties. They even come with the electric trailer brake controller, just like the F150. Ford did a good job with the Expy, though the rather dismal production numbers don't prove that. It's a very capable truck and I really think poor sales has a lot to do with lack of upgrades over the past 10 years, although the independent rear was way ahead of the times. 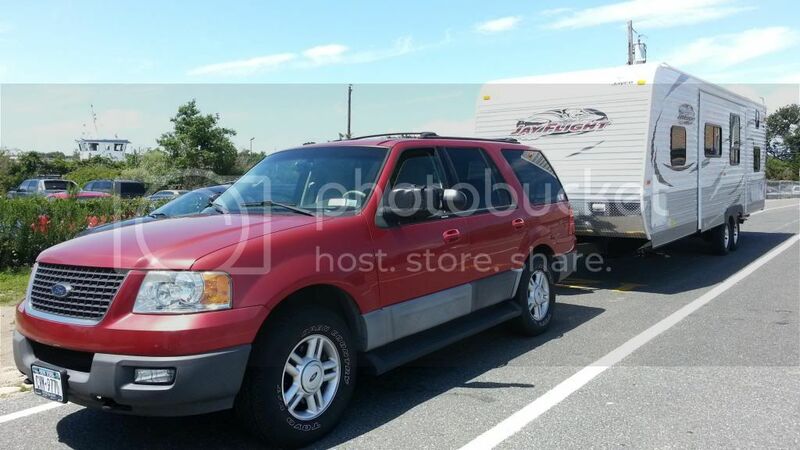 Last week our group rented an Ecoboost XLT with leather and thought that there wasn't really too much different than our 2003 - 12 years later. Nicer dash, quieter and there were some interior upgrades but Ford charges more than double for essentially the same truck. We love our Expedition, has been trouble free and done it all for us. Last year, we did upgrade our tow vehicle to an Ecoboost 2014 CC F150 - might have waited, but not sure if I would have paid a the huge premium over the pickup. Well here is ours waiting to get on the ferry. Last edited by LIEco; 04-20-2016 at 06:06 AM.